Through out the year we hope to continue to invite parents into our classrooms for various workshops and events. Running parent-child workshops promotes parental involvement in the school. It also enables the children to participate in more “hand-on” activities and experiments in small groups, under the guidance of an adult. Here are some examples of other parent – child workshops we will continue to run in the school. Parents come into the class and work at a “station”. Each station will have a particular activity in which the children will play e.g. patterns, matching activities, tangrams , snap etc. Games are very user friendly and all parents can easily participate in activities. Parent training is provided before the activity to assist parents. It is a fun activity that is enjoyed by everyone! Maths for fun will run from Monday 15th October – Friday 19th October 2018. This runs quite similarily to the Maths stations except we focus on Science Experiments. These experiments are simple and easy to follow. Experiments can include topical items such as magnets, floating and sinking, electricity, light etc. It is a fantastic way to promote science in the school and the children’s investigative skills. Science for fun will run from Monday November 12th – Friday November 16th 2018. Every child in the school is invited to participate in our Write a Book Project. This is a home-school project that is completed in partnership between parents/guardians and pupils. Books can be completed in English, another language or be bi-lingual. Books can be hand-written or typed! Click here for some types and guidelines! Shared reading will take place from 4th – 8th March 2019. Parents come into the class and read a story (in English or another language) to a group of children at a table or on the ground. Children absolutely love this activity and it is a great way for parents to interact with children in a classroom setting! Science Fair will be on 5th April 2019. Every child in the school is invited to participate in our Science Fair. This is a home-school project that is completed in partnership between parents/guardians and pupils. Projects are completed at home and are presented to school on WEDNESDAY 3rd April 2019 . Children can complete projects individually, with siblings and/or with their friends. You and your child decide! It should be a fun learning opportunity for you and your child to work together over the next five weeks on an educational project. It should also encourage your child to develop a good understanding and knowledge of “the scientific method”. We have created a Science Fair guide. This is attached below (or click here). It may be helpful. As a parent, your job is only to assist. This is an opportunity for your child to think and act like a scientist, and to create and discover his or her very own science project! Please allow your child plenty of time to make mistakes. He/she might even need to start the experiment again. Remember, real scientists constantly redo their studies by starting over again. Please make sure that your child understands everything that he/she writes and can explain the project to others. For safety reasons, please be available to assist your child with research and any portions of the experiment that may pose a safety risk. Please make time to visit the public library and use the Internet to assist your child with project research. It is recommended that you purchase the display board as soon as possible. Most craft stores, office supply stores, and superstores carry display boards for science fair projects. Remember, this is a multipart project. Your child must complete the science journal, research paper, display board, and presentation in order to receive full credit. This is a fantastic project that we will do in the last term of the school year. Parents are invited to come into the classroom once a week for approximately 4- 5 weeks. Each block is approximately 30 minutes long. In this time the parents/guardians assist the children in writing a sentence for the book. The children then decorate the page. At the end of the project each child with be presented with a certificate and their very own book that they have written and illustrated! Free workshop for parents/guardians and friends. 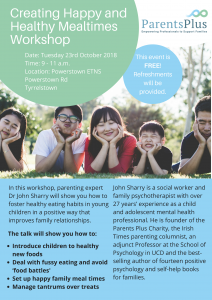 This workshop will show you how to foster healthy eating habits in young children in a positive way that improves family relationships. Workshop starts at 9am in our school hall. Tea, coffee and refreshments available from 8.30am. PETNS have organised the Zeeko Academy to come to school on Monday 15th October 2018. Zeeko Academy will speak to pupils (2nd – 6th class), staff and ALL parents about Internet Safety. Parent Workshop is on Monday, 15th of October at 7pm. If you have any suggestions of other Parent and Child classes that we could run, please let us know. We would be delighted for you to share your time, knowledge & expertise with us.